The War Eagles Air Museum is dedicated to collecting, restoring and displaying historic aircraft of the World War II and the Korean Conflict eras. This unique Museum pays special tribute to military aviation and reminds us all of the significant role these airplanes, their pilots and support crews played in securing our freedom. To demonstrate the sights and sounds of these high-powered machines, most of this magnificent collection is maintained in flying condition. These aircraft provide public enjoyment while in actual flight. The Museum features various educational programs, exhibits and special events that help preserve our heritage and promote pride in our country. NEWSLETTER! Download our quarterly Newsletter in PDF format (requires Acrobat Reader). Visit our Newsletter Archive for previous issues. 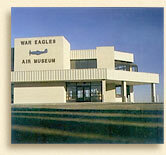 The War Eagles Air Museum is located at the Doña Ana County Airport at Santa Teresa, New Mexico. The museum is conveniently open to the public Tuesday through Sunday from 10AM to 4PM (last admission at 3:30). We've joined the Facebook community! Come "Like" our page and stay informed! All materials on this site are property of the War Eagles Air Museum except where otherwise noted. 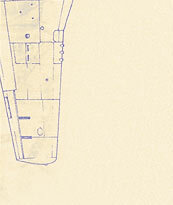 Permission is granted to use materials for educational and personal use only. Any other uses require the permission of the War Eagles Air Museum.